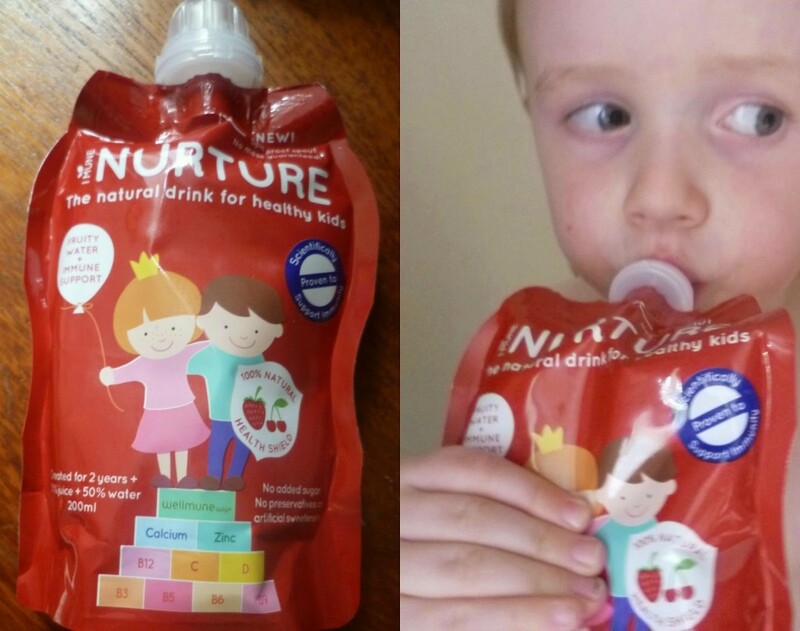 Recently launched in the UK, Imune Nurture are natural drinks for children. Launched by Derek and Lucie Sanders after failing to find a product to naturally boost their families immunity, the drinks are suitable for children over 2 years of age. Every pouch (200ml) is packed with the daily amount of key ingredients for a 2-5 year old – vitamins B6, B9, B12, C, D, Zinc and Calcium are all packed into one little pouch! These help to strengthen immune cells, support brain development and much much more. Jack is quite lucky in the sense he doesn’t get anywhere near as ill as some other children do. That being said, his immune system could probably do with a boost and since he likes to drink either squash or milk – he does drink water but would much rather either of the other two! So this fruity water seemed the perfect middle ground. We were sent two boxes to try – one a pineapple & orange water and the strawberry & cherry. I knew straight off the bat which one he would prefer and I was right – strawberry & cherry definitely disappeared the fastest in this household! I also tried a sip of both and can definitely see why the red pouches are his favourite! Whilst I’m unsure how much they are helping his immune system, he has managed to completely bypass Steve’s cold apart from a slightly blocked nose – he normally gets the whole lot and is pretty miserable and snotty for a week. I obviously cannot put that down to these alone but they may have helped. These are also great as we can take them out with us and he can drink one whenever and wherever he likes. We did have some teething problems at the beginning when he couldn’t work out how to drink from it – there is a anti-spillage device to stop any drink being spilled when the lid is off but Jack wasn’t pressing down on it so no drink was coming out. However, he is only two and at the lower age range of their target audience so I’m sure older kids would manage just fine. We will definitely be picking up more of the strawberry and cherry flavour in the future but would probably not buy the other flavour again as it seemed a little weak. They are a fab price too – these are sold at Tesco in packs of 4 for just £2.99. You can visit their Facebook and Twitter for more information about any of the products. I love how many more natural products there are for kids now. Oooh, I like the sound of these! My two year old has been plagued by ear infections and colds in his short life and as we approach winter, I'll try anything! Thanks!